If you do a Google search with some keywords related to your business, you would see most of your competitors are on the 1st page of Google by using SEM ads. They are getting the traffic and probably inbound leads every day. Your business must stay competitive by leveraging on SEM to reach out to your potential customers. SEM enables you to test different set of keywords to see what works. It is also great for you to do A/B testing, by sending traffic to 2 different landing pages and test which page gives you more leads or e-sales. SEM allows you to track how many people view your ads and what percentage click to visit your website. Together with Google Analytics or other tracking tools, you can track how many leads or e-sales you get as a direct result of your SEM ads. If you do a Google search with some keywords related to your business, you would see most of your competitors are on the 1st page of Google by using SEM ads. They are getting the traffic and probably inbound leads every day. Your business must stay competitive by leveraging on SEM to reach out to your potential custoSEM allows you to reach out to global audience by selecting countries or regions that you wish to advertise on. If you own a local shop and only wish to target your neighborhood, you can set a specific targeting radius to your campaign and only reach out to the audience in your area.mers. You can tailor your SEM budget based on your sales goal and spend within a limit that brings you the highest ROI. There is no pressure for you to start off with huge investment like offline advertising. Adjust your SEM budget along the way after results is seen. SEO is a long-term marketing tactic that propels your website to the top of search result pages for keywords that are important to your business. Do you have clients interested in doing SEO or SEM but you do not have the resources to manage? Become our SEO or SEM reseller and outsource your clients to us. We do the legwork - you save time and earn an attractive commission. 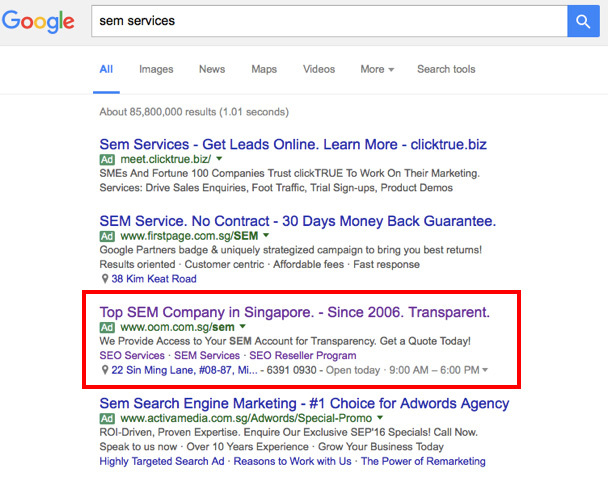 GrabSEO is an SEO company in Singapore that has been helping both SMEs and MNCs on their local and regional SEO and SEM work since 2006. Copyright © 2019 Grab SEO Singapore | What is SEO?